Vocals: Rebecca Barclay, Gaye Zimmerman Huycke. Pipes: Rory Sinclair. Guitar: Dean Cavill. The MacCrimmons were the legendary hereditary pipers to the MacLeods of Dunvegan on Skye. Donald Ban MacCrimmon, against his Chief’s wishes, joined the cause of Charles Edward Stewart in the rising of 1745. In a skirmish outside Inverness known as the Rout of Moy, there was only one casualty – Donald Ban MacCrimmon – and it was he who predicted his own death by composing this eerie tune less than a year before it occurred. Rebecca Barclay brought this extraordinary version of the tune to our band. Each line she sings occurs in the Piper’s Received Version but not in the same order we have here; I have honoured Rebecca’s interpretation by playing the pipes in parallel phrasing to her voice. Bagpipe: Rory Sinclair. Guitar: Dean Cavill. Lonely Loch nan Eun or “Lake of the Small Lambs” was composed by P/M Bert Barron who was mentor and teacher to my good friend Ray Bell, a brother member of the Piobaireachd Society. This is a wonderful composition and I say with as much respect as envy: I wish I had written it…. This is followed by the classic My Home which was one of the late Queen Mother’s very favourite pipe tunes. As we will be at Castle Mey, it is only right that this be played in honour of the late Patron of the Clan Sinclair Trust. Both tunes are played with seconds or what non-pipers would call harmony. Vocals: Malcolm Sinclair. Bagpipe: Rory Sinclair. I composed the first part of this tune in 1996 and it became part of the Rosslyn Chapel Suite. The second part was composed in 2003 when my good friend Jim Buchanan, a small piper who lives in Roslin, wrote to tell me he wanted to play it in a competition but it needed a second part. I was lucky enough to hear that second part whilst driving my truck down Mount Pleasant Avenue in Toronto on a hot July day. I phoned home and sang it in to the answering machine so that I could not forget it. I had always thought it might do well with words but could never get close to them. When getting together with Malcolm for this CD, I la-laed the tune into his tape recorder and two hours later he sent me these lyrics by email. I am still in awe of this talent. Malcolm Sinclair and the “Burns Unit”. Vocals: Malcolm Sinclair. Smallpipe: Rory Sinclair, Guitar: Dean Cavill. Drum: Terry Campbell. An original tune with words and music by the Rev. Malcolm Sinclair commemorates his great uncle, P/M William McPherson Sinclair of the Gordon Highlanders. (The Chief’s father was Colonel of the Gordons.) The young Sinclair died of his wounds sustained at the First Battle of Ypres, November 27, 1914. Vocals: Malcolm Sinclair. Guitar: Dean Cavill. This tune is from Lady Nairn’s collection and she is credited with this extraordinary lyric which rivals some of Burns’s best. The tune is the same as for Scots Wha’ Hae wi’ Wallace Bled. Vocals: Malcolm Sinclair. Smallpipe: Rory Sinclair. Guitar: Dean Cavill. deepest feelings here as they experience returning at last to their ancient homeland. Malcolm wrote these lovely words that bear witness to the meaning of “return” to an exile. Here are three of my own compositions. The Vision of Earl William St Clair of Rosslyn is the first pipe tune I ever wrote – I had my late father in mind as it unfolded. He was the one who wanted a piper in the family and I was so lucky that his wish became my eventual obsession. Earl William, who founded Rosslyn Chapel in 1446, represents the highest achievement of the Sinclair/St Clair Family in Scotland and I thought his achievments should be honoured. 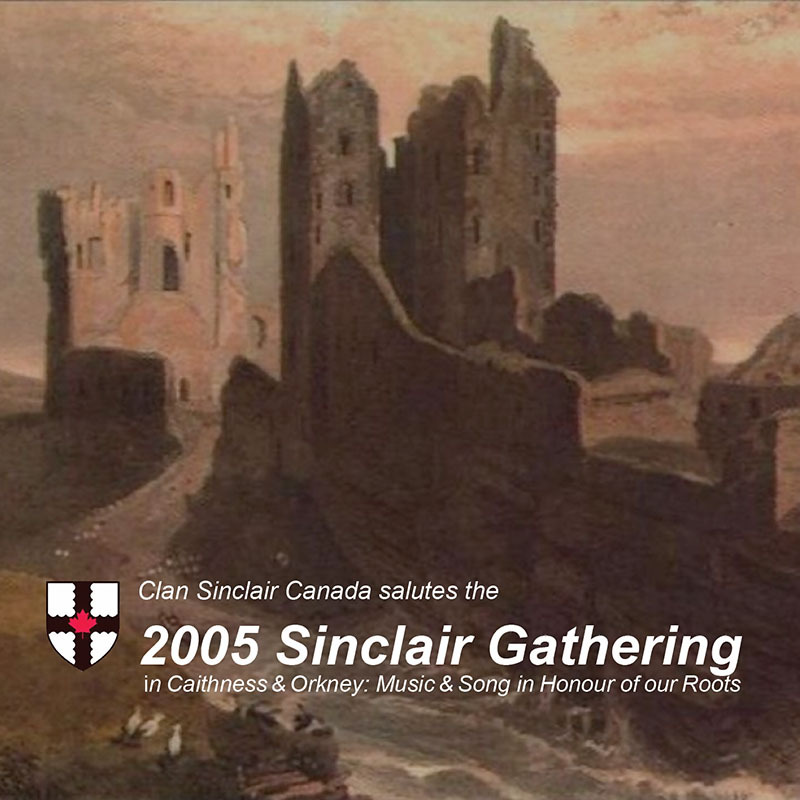 The Earl of Caithness’ March was composed for the present Earl in honour of his role in the First Sinclair Gathering 2000. There are several Sinclair tunes, but there were none for the Earl and so I wished to fill that void. Roselma Sinclair’s Hornpipe was composed for my late mother in 1993 when she was living with Mary and me in Toronto. She loved it, and I have photographs of her gamely dancing to it in our living room. Bagpipe: Rory Sinclair. Guitar: Dean Cavill. Drum: Terry Campbell. Taking off from a very fine jig of the same name composed by P/M Donald MacLeod, Dean has produced a little playlet as a setup to a screaming Rock ’n’ Roll version of the Glasgow City Police Pipers. It was played on Burns Day in 2003 on CBC radio.